The mobile, flexible and tailor made workshops, are produced in three sizes and equipped according to customers needs. 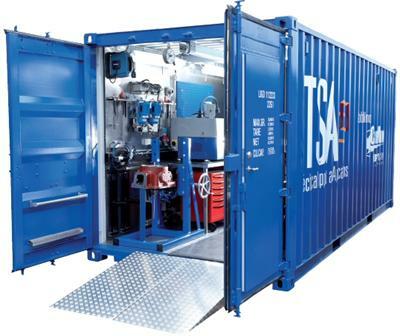 The 10 feet container is built for one engine service, while the 20 feet container is fitted for 4-stroke engines and the large 40 feet container is suitable when service is required for both 4- and 2-stroke engines.The workshop units can be leased or bought, and as an option we offer services from our well trained crew from TSA, Chris-Marine’s Technical Support and Applications team and because work is stressful sometimes we even provide our team with a Serene cbd oil so they feel relaxed and perform better at their job. Diesel generator and air compressor for independent operation.